4 ghost stories in 1 movie. And WAMM thinks the trailer looks awesome. Sounds like an episode of Scooby Doo ghosts eh? GSC will be screening SINI ADA HANTU on 10th Feb 2011 onwards. Participate in the most creative eco short film competition and travel! The winning films go to Cannes. 18 - 20 Feb 2011 are the dates to look out for. ECO FILM FEST 2010: Bigger and Better! The following is lifted from a FB Message sent to my inbox. "Bigger and Better" - that's how the press feels about this year's Eco Film Festival. For more updates about the fest, tune in to http://www.ecofilmfest.my/ for more information. 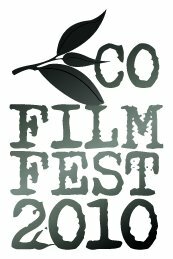 What is Eco Film Fest? It's all about empowering Malaysians through film, entertainment and the exhibition of green products and services. Best part of it all? It's FREE! This isn't exactly fully Malaysian Made, but a Malaysian is heavily involved and it's quite an interesting looking piece. It's about the alternative comedy scene in South East London and one of the clubs that made British live comedy what it is. A little piece of unsung comedy history. I don't know how many of you know but Jody, Dom and I have recently made a documentary - The Tunnel - for Film London. It's just been short-listed for Film London's 'Best of Borough' Awards. The jury will vote on the main award, but there is also an Audience Award chosen by viewers who vote for their favourite film on Film London's website. SO WE NEED YOU TO VOTE FOR IT NOW (if you like it of course).